Good Nutrition is vital to all swimmers. Anita Bean BSc R Nutr is a registered nutritionist and health writer, specialising in sports nutrition. She has written a number of books on the subject and advises Guildford Swimming Club swimmers of their nutritional needs. She has kindly let us use her material on our website. Nutrition is an important part of your training programme. Eating the right types and amounts of food, as well as drinking enough fluid before, during and after each training session will help you perform better, and recover faster between training sessions. It will also help to keep you healthy and reduce your chances of getting colds and other illnesses. What’s a healthy diet for swimmers? Swimmers need a high carbohydrate diet to fuel their bodies during training, as well as adequate protein for growth and muscle repair and (mainly unsaturated) fat for fuel and overall health. A general guideline is to have one third of the plate carbs (pasta, bread, rice, potatoes, or cereal), one third protein (fish, chicken, lean meat, eggs, beans, lentils, tofu) and one third vegetables (or salad). You should also include healthy fats (olive oil, oily fish, nuts) and at least 5 portions of fruit and veg a day to ensure you get the omega-3 fats, vitamins, minerals, fibre and other protective nutrients needed to stay healthy and promote recovery. How much energy (calories) do swimmers need? Your calorie intake depends on your calorie expenditure, body size, weight, and how much musvle you have. On top o fthis you need extra claories to fule your training sessions (approx 1000 calories/2 hours). SO a typical 60kg male swimmer would need about 3400-3600 calories a day, a 55kg female about 2800-3000 calories. If you’re doing circuits, land training or other sports, add an extra 300-400 calories/hour. 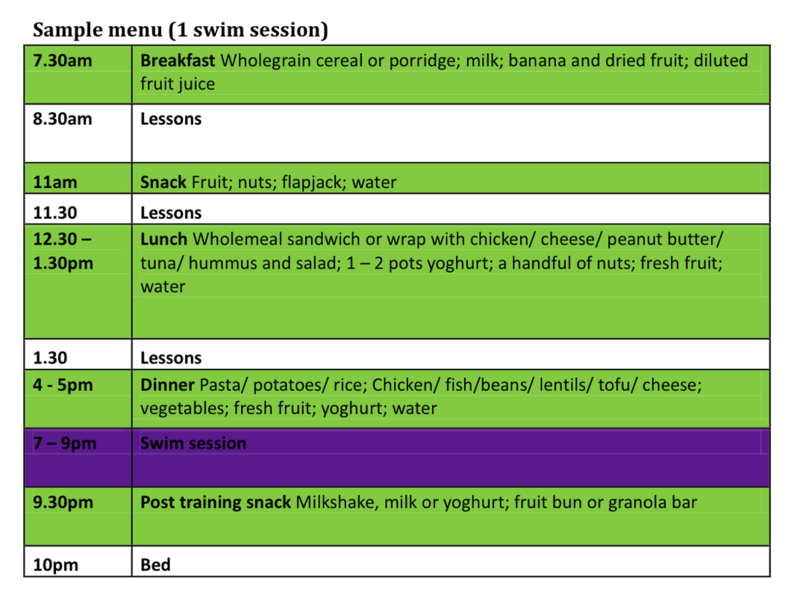 When to eat before training? If you train in the evening, your earliet meals and snacks will help to fuel your workout. Make sure you eat at regular intervals and never skip meals. The optimal time for the pre-excercies meal is 2-4 hours before trianing. If your training session starts at 6.30pm, have dinner at 3.30 or 4.30 pm. Aim for ‘comfortably full’, not stuffed. If there isn’t time for a meal then have a smaller meal or healthy snake 30 minutes or 1 hour before training, with a drink. Of all the foods you could have before a workout, prioritize ones rich in carbohydrates, especially if you will be training for 2 hours or longer. This is the body's preferred energy source during exercise. Opt for wholegrain carbs wherever possible, together with a source of protein and some veg - this will provide sustained energy and improve performance. Start re-fuelling within 30 minutes after training, even if it’s late in the evening. This will help your muscle recover faster. Your recovery snack should contain carbohydrate to replenish depleted fuel (glycogen) stores, as well as protein to repair and rebuild the muscles. It can be similar to the pre-training snack, perhaps with a little extra protein. Good choices include milk and milk-based drinks (milkshakes, hot chocolate, etc), yoghurt, oat-based bars, cereal with milk, or nuts. Dehydration slows you down and will make swimming feel much harder. The most important thing is you arrive at your training session properly hydrated, (you can check for dehydration with the ‘pee test’). Drink plenty during the day, little and often. Have around 250 – 300 ml 2 hours before the session. During training, have 3 – 4 gulps every 15 minutes (or at convenient intervals), rather than a large volume in one go. Generally, the rule is to drink about 125ml of fluid for every kilometre swum. Drink plenty after training to aid recovery. How to avoid fatigue during training? 1. Dehydration - avoid this by making sure you drink enough before and during the session. 3. Depleted reserves of carbohydrate in your muscles (glycogen) – avoid this by eating a balanced meal containing carbs and protein (and some fat) about 2 – 3 hours before training; eat consistently during the day; do not skip meals. Should swimmers eat anything before an early morning session? Training on empty may result in low blood glucose levels, light-headedness, nausea and a poor performance. If a meal is out of the question, try to have a nutritious high-carb snack, such as toast with honey, dried fruit or a banana. Alternatively, try a nutritious drink, such as milk, milkshake or a smoothie. Some fuel is better than no fuel at all. Is sugar good or bad for young swimmers’ performance? I frequently see swimmers eating sweets and drinking sugary drinks before training sessions in the belief that sugar will aid their performance. In fact, the opposite has been shown to hold true - consuming sugar before exercise does NOT improve performance or stamina. Eating lots of sugar triggers high levels of insulin in the bloodstream, which takes sugar out of the blood stream rapidly, resulting in a sharp drop in blood sugar. This rebound effect can make you feel tired, weak and lightheaded. Instead, eat a healthy pre-training meal that includes wholegrain carbs and protein. If you need a pre-training energy boost, it’s safer to choose foods, such as bananas, dried fruit, and oat (granola) bars that won’t play havoc with blood sugar levels. How to Gain Weight - Not for parents!! !